I finally understand all of the hype. I listened for years as the "older folks" discussed the beauty of it all…the joy it brought them. But I just didn't get it. They could seriously talk passionately on the subject for hours…days even. The magic of it all just escaped me. My lack of understanding would not allow me to wrap my brain around it let alone embrace the miracle of it. I completely get what they were talking about…what they would go on and on and on about. Growing your own delicious fruit or vegetables and having so much abundance that you can share with your neighbors is truly a gift. (for you and everyone else lucky enough to benefit from it). Now that I have my own yard with a tree that is bearing fruit…I've turned into one of them; the older folks. It's really something I can't quite explain and only those who have experienced it personally can truly appreciate it. 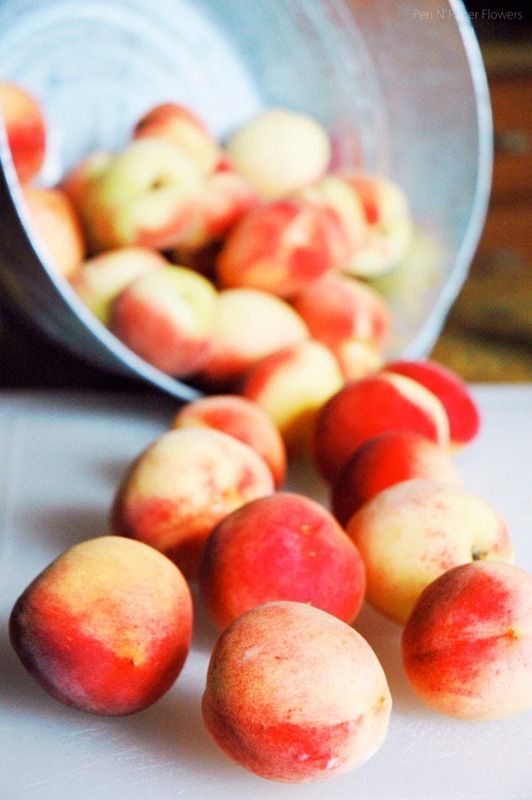 There's a joy and a deeper connection to the heavens when you can walk out of your back door with your children and fill a bucket with fresh, delicious peaches together - plucked from your own tree! That sounds SO overly dramatic, doesn't it? But I'm NOT even kidding. I seriously cannot get over the fact that I have a peach tree. And not only do I have a peach tree...there are actually peaches growing on it! Ha! I didn't even know you could grow peaches in Florida! We were just fortunate enough to have bought the house with the tree already in the backyard. These are peaches I've eaten and peaches I've shared with neighbors, friends, family and even my favorite local cupcake shop! (They made a peach cobbler cupcake with MY peaches). Yum! and pinch me please! 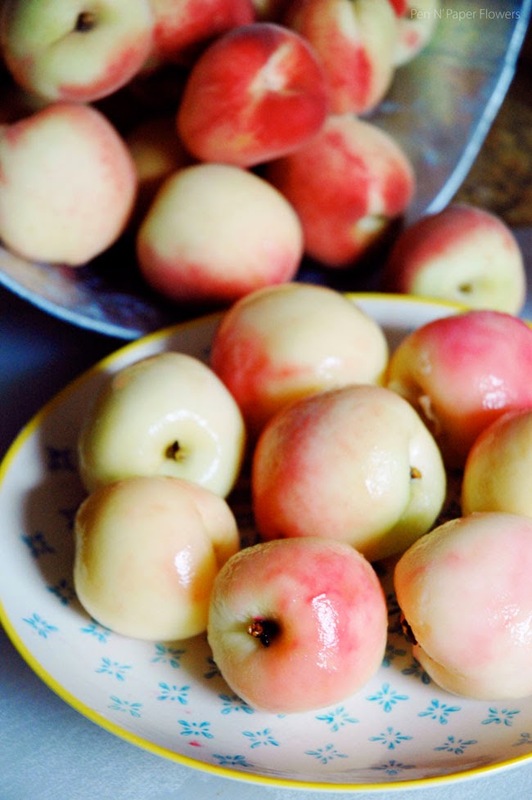 I've been scouring the internet for all kinds of peach recipes - everything from savory to sweet and I intend on sharing them with you as I make them. 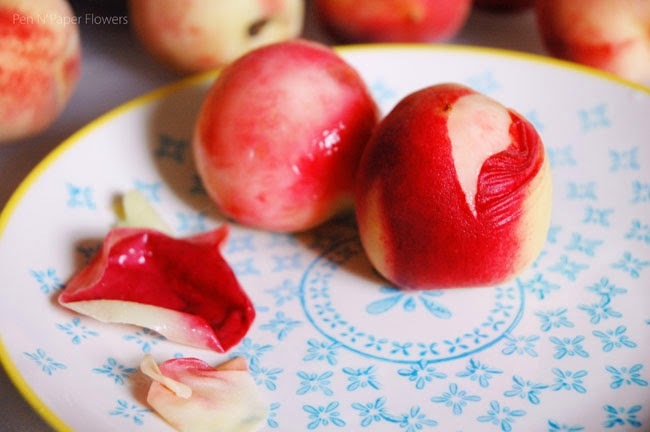 I just learned this trick as I was researching peach trees, peaches and recipes. It's so simple I can't believe I hadn't ever heard of it before or had someone tip me off earlier. 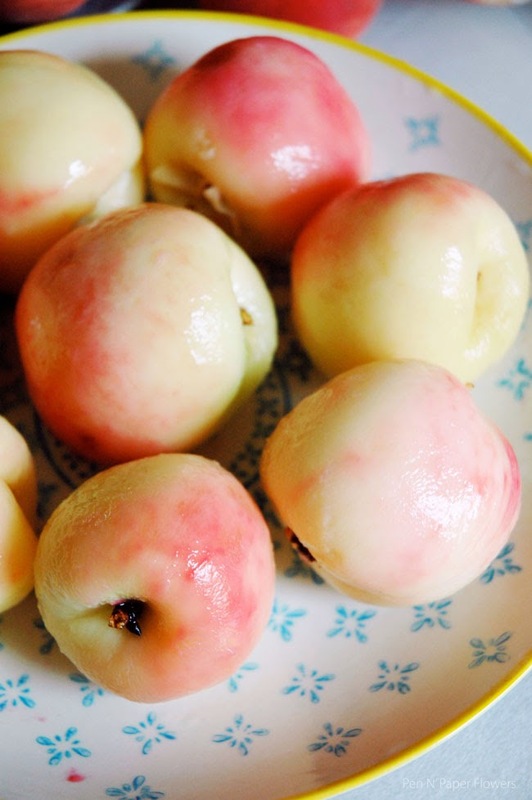 Place a ripe peach into a pot of boiling water for 30 seconds. Remove it with a slotted spoon. Pull it out of the water and use your thumb to push/peel the skin right off. If done correctly, the peel literally slides off of the peach in one piece - like a glove! Aren't they pretty?! I love how there's still hints of pink in the actual peach even after the skin is removed. It's so easy to do you'll have a bucket of peeled peaches in no time. I peeled about 20 peaches in less than 15 minutes. 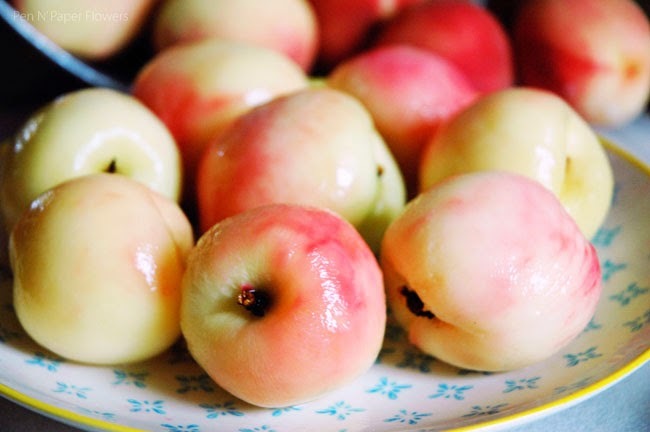 - You'll know you didn't boil your peach long enough if the skin doesn't come off easily or sticks in random places. - They are slippery little suckers once the peel is off so be careful not to drop them. Now that they are peeled you can eat them or cut them up for whatever recipe you are getting ready to make. You would think this is the first time our peach tree has produced fruit with how giddy I am over it. We actually enjoyed peaches from our tree the very first year we moved in and then it went dormant for the last two years. Not sure why. Still researching and trying to figure out how to properly care for it so it produces more abundantly. I know NOTHING about fruit trees. And poor thing…it's not been pruned properly so some of the longer branches are now touching the ground because of the abundance and weight of the peaches. Not good. I'll be fixing that when it's time to prune. 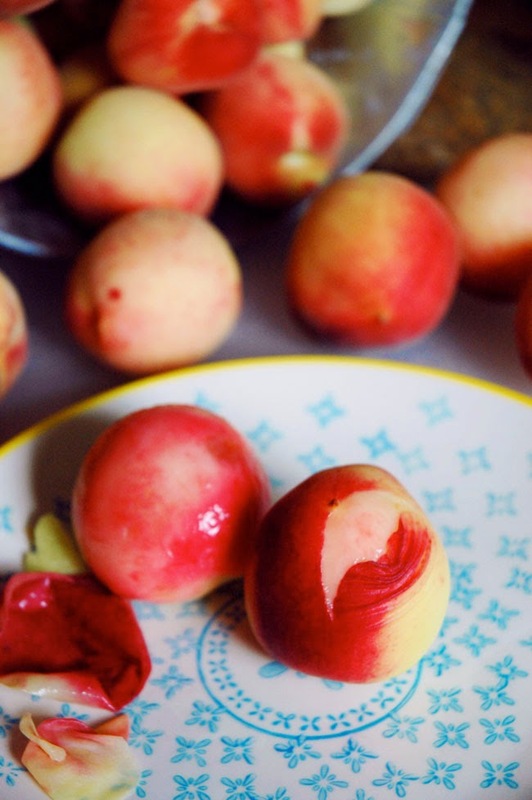 And guess what…I never even liked peaches before we had our own tree. My neighbor informed me these are "white" peaches and trust me when I say they are heaven!